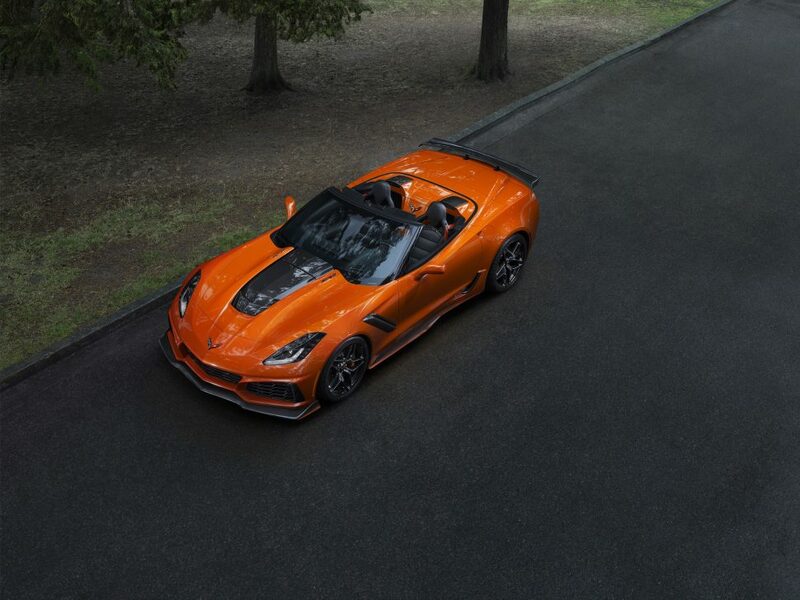 The fastest, most powerful production Corvette ever – the 755-horsepower 2019 ZR1 Convertible. All photos courtesy of GM. In the January 2019 issue of Hemmings Muscle Machines, we look at some of the muscle era’s strongest Corvette engines. We end the printed story at 1972, when gross horsepower ratings were replaced by SAE net ratings. Horsepower took a bit of a backseat to other considerations in the ’70s and most of the ’80s; a combination of insurance laws, new emissions rules, and crash standards as the mid-’70s approached meant that performance was on the back foot for a while as Detroit’s engineers worked out how to balance things in this new, highly legislated world. Corvette was only slowed down by the issues that killed the muscle car dead. Power started becoming a priority again in the early ’80s, thanks to advances in computer technology that saw fuel injection come back to the fore, but it wasn’t until the very late ’80s and early ’90s that Corvette led the charge for V-8-powered cars making serious horsepower once again. Today, even base Corvette engines have a higher horsepower rating than the (advertised) numbers of the hairiest haulers from the muscle era, and we haven’t listed every single Corvette engine here. Also remember: The advertised horsepower ratings in this list aren’t directly comparable to the old gross power ratings, so apples-to-apples comparisons are impossible. If anything, it makes modern Corvette power all the more impressive. Six hundred (or more) horsepower, and a warranty? Oh yes. We pick up the Corvette’s story in 1990. When the General bought British sports car maker Lotus in 1986, it immediately wrangled the firm’s engineering group into creating a new engine (and set them to work on the steering and chassis, too) for the C4 Corvette. The result was the ZR1, a Corvette meant to take on the world. 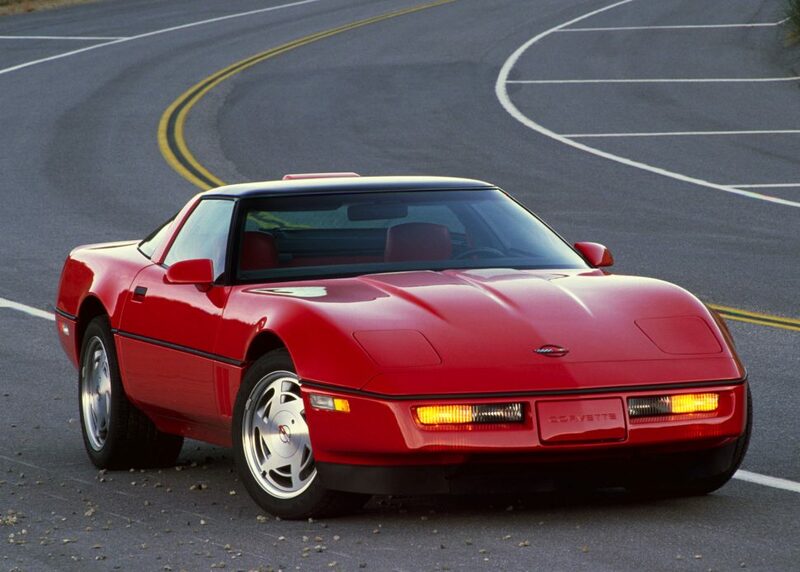 The exclusive all-aluminum V-8, called LT5, shared small-block Chevy bore centers specifications but little else: with four overhead camshafts, 32 valves, and a 385-horsepower rating, it stood well above a standard Corvette’s 250 hp in 1990. The engine required special assembly; the work was farmed out to Mercury Marine in Stillwater, Oklahoma. No other car used the LT5—it was a ZR1 exclusive. GM wanted 400 horsepower out of the ZR1, and for the 1993 model year, tweaks to the cylinder heads, valvetrain, and exhaust saw the power rating rise to 405 hp. 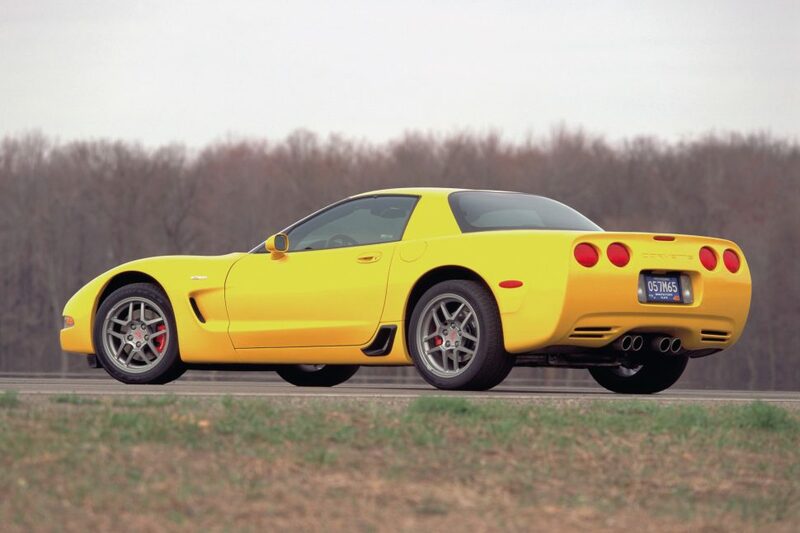 The ZR1 ended in 1995; there wouldn’t be another 400-hp Corvette until the 2002 Z06. The new-for-1997 Gen-III V-8, which came to be known as the LS-family of corporate small-blocks, was a clean sheet of paper: like the LT5, the only thing the new engine shared with the old small-block was bore spacing. 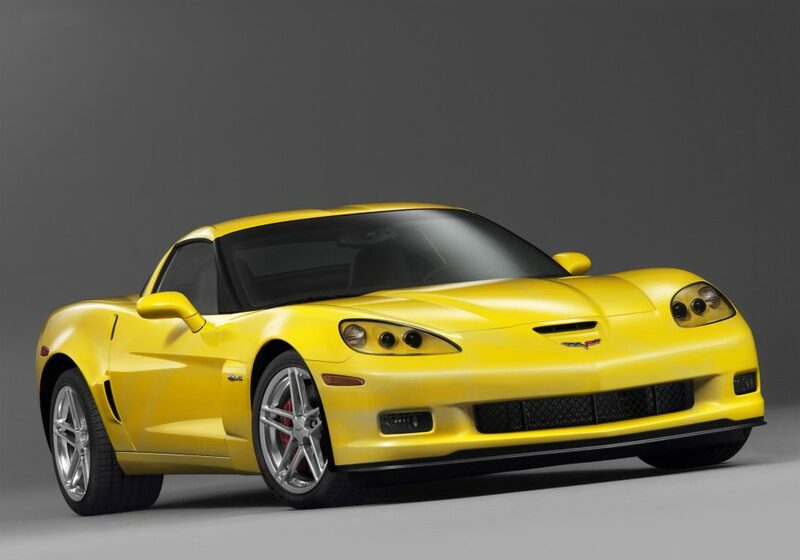 Base C5 Corvettes made 345 horsepower, but the hot Z06’s LS6 V-8 shared only a common architecture with the base motor. The Z06 was treated to new higher-flowing, higher-compression heads with better-flowing intake and exhaust ports, a hotter cam with more valve lift and overlap, a new intake manifold, and more. That was good for 385 horsepower at 6,000 rpm. A year later, power jumped to 405 horses, thanks to a revised intake and cam timing, among other changes. 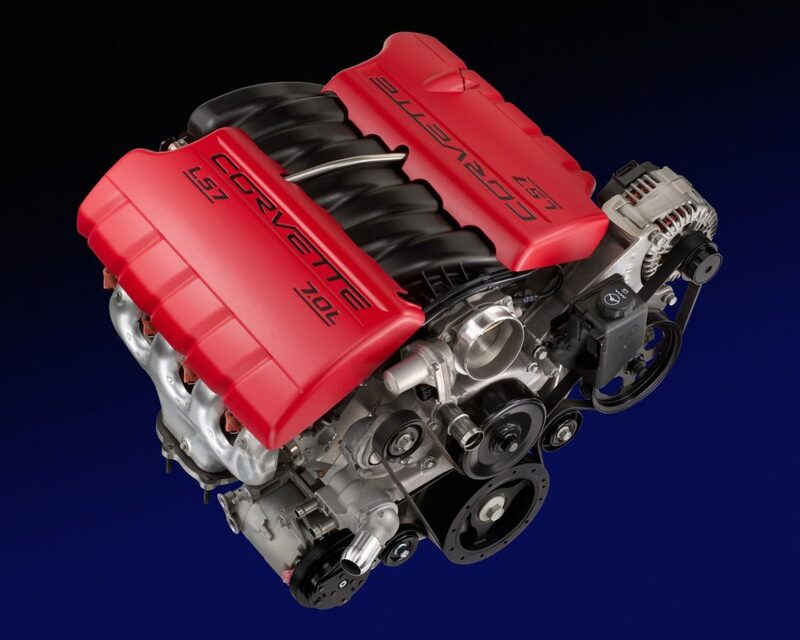 Toward the end of the C5 Z06’s life, a 6.0-liter version, called LS2 and also making 400 hp, replaced the LS6 in the Z06. When it arrived in 2005, the new C6 Corvette’s stock LS2 V-8 offered a healthy 400 hp—meaning the base car now had the power of a C5 Z06, or a C4-era ZR1. Enthusiasts didn’t have to wait long to learn about a still-hotter version. Co-developed with the Corvette race team, the Z06 package took things a step further with its 7-liter (yes, 427 cubic-inch) hand-built dry-sump V-8, using C6R-fettled race-based technologies (like titanium connecting rods). The “LS7,” as it was known, was rated at a whopping 505 horsepower—the first time a Corvette was advertised at or beyond the 500-hp mark, and the highest-performance naturally aspirated production small-block that Corvette has ever had. It was hand built at GM’s Performance Build Center near Detroit. The base-model C6 Corvette offered 435 horsepower from the factory. 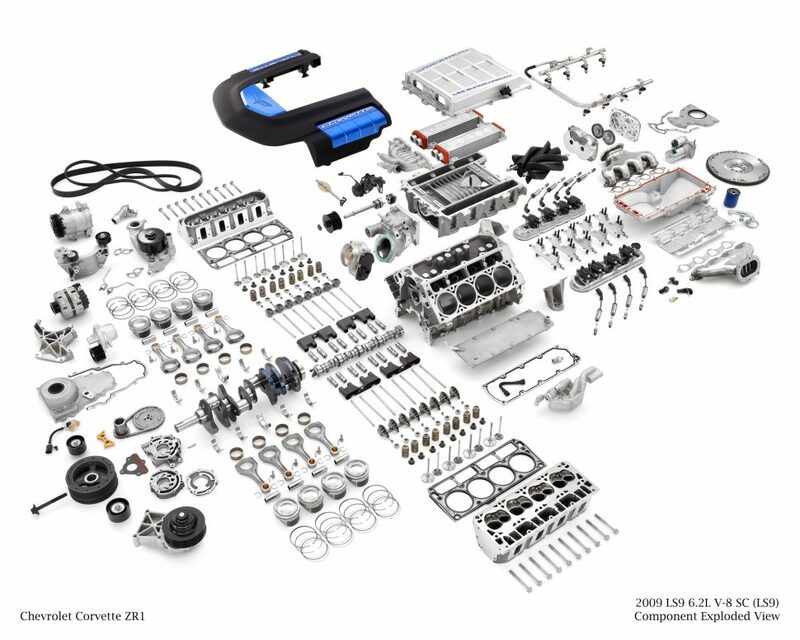 Using the 6.2-liter LS3 as a starting point, Chevy’s engineers went hog-wild to develop the LS9 in the 2009 ZR1: a Behr-intercooled four-lobe Eaton supercharger offering 9.4 pounds of boost, a cam with .555-inch lift, and Rotocast-A356T6 aluminum heads with 2.16/1.59-inch valves are among the culprits that generate an eye-opening 638 horsepower. From 376 cubic inches. Six-bolt main-bearing caps, oil-spray cooling, and a nine-bolt crank flange (where the flywheel attaches to the crankshaft) are among the features that make this kind of power reliable and repeatable. The LT4 is based on Chevy’s Gen-V family of small-block V-8s. Although the specifications are similar to the 2009 LS9, the updated engine architecture allowed for the integration of new technologies (direct injection, Active Fuel Management/cylinder deactivation, continuously variable valve timing, et al). It’s still Eaton-supercharged, still runs 356T6 aluminum heads, The result? The 2015 C7-generation Z06 reaches 650 net rated horsepower. Starting with the Z06’s LT4, GM’s mad scientists found another 100-plus horses lurking. A new Eaton TVS Roots-type blower contributed 52 percent more internal volume than the Z06’s huffer, and raised the boost pressure to 14 psi. A larger pair of intercoolers have twice the heat-transfer ability of the LT4’s. The primary fuel injection is now supplemented by a port-injection unit. The result? 755 horsepower, and 715 pounds-foot of torque—at 2 horsepower per cubic inch, the most powerful passenger-car engine Chevy has ever built. The “LT5” name is a nod to the original “King of the Hill” ZR1, which launched in late 1989 as a ’90 model. As much as Corvette storms madly toward the future, it always tips its hat to the past.